Like I mentioned in last Tuesdays post, as soon as Christmas is over, I immediately start planning my NYE outfit. I'm one of those girls that believes sequins can be worn to almost any occasion, however, they are a necessity on NYE. I usually go for the super loud, all-over gold sequins, but I decided to switch things up a little bit this year. Typically, we go out with friends to dinner to a fancy restaurant downtown, but this year, we're staying in at my (gorgeous) friend Amy's house for a super-chic house party. I wanted an outfit that was a little more subdued, but still encompassed my idea of NYE necessities: sequins, a big bow and a great pair of pumps. These sequin track pants are SO comfortable!! I hate that the exact pair from Piperlime is sold out, but I found two (almost exact) pairs from Nordstrom that I linked below. This outfit is perfect for keeping that NYE look, yet staying comfortable for a fun night with friends! I hope you all had a lovely holiday! It was so nice to just relax and enjoy time with family + friends the last few days. I always look at the holidays as a time of reflection and I can remember certain moments + events in my life while growing up that I wouldn't change for anything in the world. You realize that it's those little moments, both as a child and an adult, that have made you who you are today. I'm only 25 years old, but life has already taught me so much in that short amount of time. The good, the bad and the ugly, all have one thing in common and add up to one big moment- you. So, without going on and on, that's one of my new years resolutions. Simply cherishing the moment. More on that later this week! P.S. - If you're looking for a fun NYE idea to ring in the new year, this is something we did last year: Blow up 10 balloons and fill them each with a cup of gold glitter. Hang them upside down from the ceiling in a row and right before midnight, while counting down from 10 to 1, each person pops a balloon while standing under them! Don't get me wrong, this is definitely messy, but who doesn't love going home with glitter in your hair at the end of the night?! Remember my "we found gold glitter in our bed for months after last years NYE" comment ... yeah, that was because of this. But hey, those 10 seconds are the most anticipated part of the night, so why not have a little fun with it! I love the pink jumper! 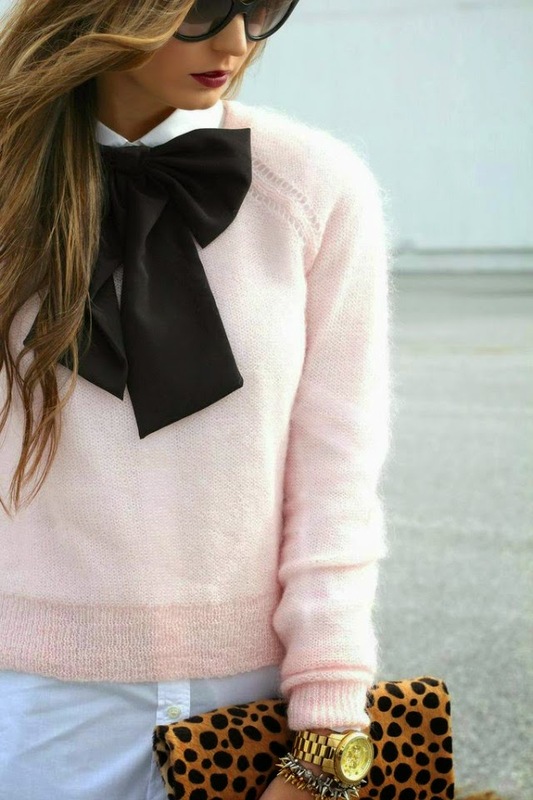 Looks so cosy :) and with the bow it´s perfect to dress it up. I love this look! 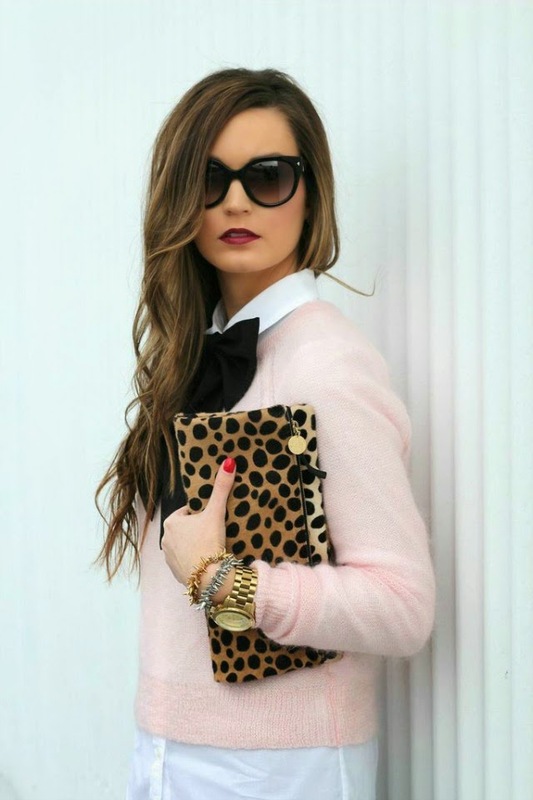 I love the pink sweater with the leopard clutch! I love this outfit! Those black sparkle pants are so fun and that blush blouse with the black bow is perfect! I wish I did something on New Years Eve but I don't…it's always so boring for me sadly. I need to do something fun next year! Love the pants - so festive! I think staying in at a house party is the best way to spend nye. The glitter balloons are a fabulous idea! So darling! The bow is adorable! Question: what plugin do you use to have your signature at the bottom of each post? (love the sparkly pants btw - I purchased the Trouve ones from Nordstrom and love them!) Thank you!